During the reign of Napoleon III in the 1850s and 60s Paris experienced a dramatic transformation under the direction of Georges-Eugène Haussmann. Haussmann cut many boulevards through the crowded, medieval city placing prominent public buildings at the boulevard ends to provide impressive vistas. The boulevard Malesherbes was laid out cutting northwest from La Madeleine. Saint-Augustin, close to the spot where Haussmann was born, was built to provide a counterpoint to the famous columns of La Madeleine at the other end of the boulevard. It was also designed to be visible from the Arc de Triomphe down the avenue de Friedland. The chosen site, an odd shaped lot at the intersection of four streets, and the need for a dome of 200 feet (61 m) so as to be visible from the Arc de Triomphe, dictated unusual proportions for the building. The church was designed by Haussmann's fellow Protestant, architect Victor Baltard who also famously designed Les Halles markets. While Baltard's use of iron in Saint-Augustin's structure is praised for its inventiveness, at least one critic has described the church as, "an eyesore: ridiculously sited, without proportion, crushed beneath an outsized dome." 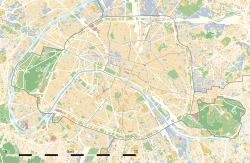 The neighborhood around the church is now one of the most expensive in Paris. Saint-Augustin was built between 1860 and 1868 in an eclectic style combining Tuscan Gothic and Romanesque elements. The structure is 300 feet (91 m) in length and 240 feet (73 m) in width, and was one of the first sizable buildings in Paris constructed around a metal frame. Saint-Augustin's facade features a frieze by François Jouffroy depicting Jesus and the twelve apostles above the four evangelists. Internally, the stained glass windows depict bishops and martyrs of the first centuries and the cast-iron columns are decorated with polychrome angels. A statue of Joan of Arc, by Paul Dubois, was erected in the church in 1896. The church features paintings by William-Adolphe Bouguereau, Jean-Hippolyte Flandrin, Émile Signol, Alexandre-Dominique Denuelle and sculpture by Albert-Ernest Carrier-Belleuse and Henri Chapu. It was intended to be the resting place of Napoleon III and the Empress Eugénie who died in exile and were instead interred in St Michael's Abbey, Farnborough in England. The organ is celebrated in the world of organ building. The church's main organ was built by Charles Spackman Barker. One of the earliest organs to employ electricity, it features 54 stops with three 54-key manual keyboards and pedalboards. The interior showing the cast iron shafts and iron-framed roof. ^ "Eglise Saint-Augustin". Monuments historiques. La Ministère de la Culture. ^ "Saint Augustin Church". Napoleon.org. ^ Jordan & p. 489. ^ Jordan & p. 195. ^ Jordan & p. 243. ^ "Saint Augustin". The Organs of Paris. Jordan, David P. (1995). Transforming Paris: The Life and Labors of Baron Haussman. Simon and Schuster. Wikimedia Commons has media related to Église Saint-Augustin de Paris. This page was last edited on 6 August 2018, at 14:48 (UTC).